The boys of Guns N’ Roses had a reputation for the fun things in life but a new type of beer is not one of them. Guns N Roses has opposed a Colorado-based brewery’s attempt to register a trademark for its GUNS N ROSE beer claiming the name would cause a whole lot of confusion. Sometimes the world of trademarks makes me scratch my head in confusion…and then beat it into a wall. In August 2018, Oskar Blues Brewery out of Colorado filed an intent to use trademark for a new name of beer, GUNS N ROSE. It clearly says the word “rose” in the trademark filing. But it appears that Oskar intended the mark to say “rosé” as the beer is now for sale under the name “Guns n Rosé”. It is described as “a crisp rosé-ale brewed with prickly pear and hibiscus.” Get it?? So the name on the trademark registration application is technically wrong and I guess the brewery thought it would squeeze a pun through as a trademark registration. Not so fast. Guns N’ Roses, a California partnership, composed of W. Axl Rose, Saul Hudson (Slash) , and Michael “Duff” McKagan, three founding members of the band but not all the founding members. The band has used the name, but not necessarily been together, for the past thirty years. The band is world famous as is its name and trademark. 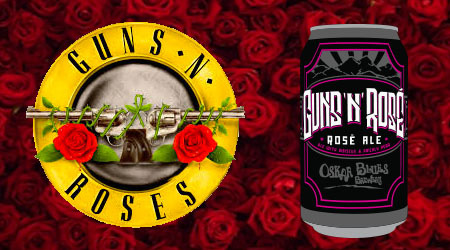 GNR argues that if you see the beer can on the right with the GUNS N ROSE mark, you are bound to think the beer is affiliated with the rock band, when it is not. Not a stretch here as I am sure the common consumer would think the same. No way do I see this mark getting through. The names are too similar and confusion between the two marks is inevitable. The beer is now being distributed so Oskar could also get sued for trademark infringement. Maybe a name change is prudent, perhaps “The Stone Rosés”.